Learn how to make our favorite Maryland crab cakes recipe. This is definitely a must make if you are a crab fan! Jump to the Crab Cakes Recipe or watch our quick video showing you how we make it. One thing we’ve enjoyed experimenting over the last month or two has been this recipe. Living near the Chesapeake Bay means that our summer weekends are full of sunny days, cracking crabs, an abundance of sweet corn, Old Bay and the water. Its all incredibly exciting. With all of that comes a serious love for Maryland-style crab cakes. A great crab cake doesn’t call for lots of ingredients, it has a ridiculous amount of sweet blue crabmeat and has very little filler. So lump crabmeat is pretty expensive. That said, we really do believe that lump (preferably jumbo lump) crabmeat makes the absolute best crab cake. It was hard for us to take out our wallet at first, but once we realized 1 pound of crabmeat can make 6 generously sized cakes — or 24 mini crab balls — we were sold. Oh, and don’t worry, nothing else called for in our recipe racks up the bill — it’s just saltine crackers and a few extras you probably already have in your fridge. Around here, fillers and extras are a no-no. All the menus promise “no filler” crab cakes. In all honestly, you do need a little bit of filler so they stay together. We go for the absolute minimum, which is a glue made from crushed saltine crackers, mayonnaise and one egg. It works beautifully. We start by tossing the lump crab meat with the crushed crackers. The crackers absorb extra moisture from the crab. 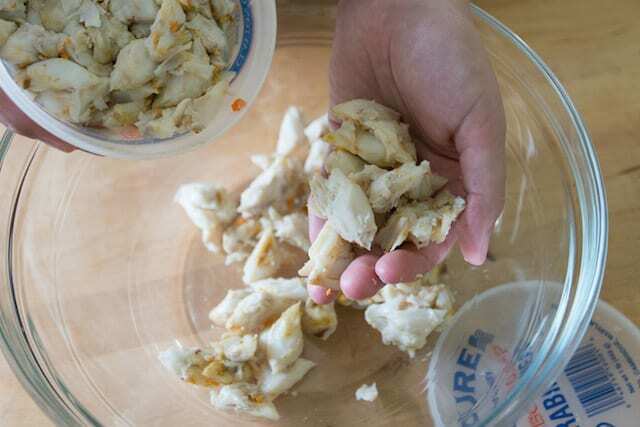 Then, we make a mixture of mayonnaise (we love to use homemade mayonnaise), egg, mustard, and some Worcestershire sauce and add it to the crab and cracker mixture. After a few stirs, the mixture is pretty loose. That’s why you see us sliding it into the refrigerator. We keep it in there for an hour or so. The crackers continue to absorb the liquid and that glue I was talking about earlier forms. After some time in the refrigerator, you can easily form the cakes. We like using a 1/2-cup measure to make 6 generous cakes, but you can make them slightly smaller and make 8 or make them donut-hole size for mini crab balls. Our local restaurants usually give us three options for how they are cooked: fried, pan-fried and broiled. We never request fried, so we’re not going to spend time talking about that. We do, however, ask for pan-fried and broiled often. Pan-frying is great — they become dark golden brown and a little crispy on both sides. We love using our cast iron pan, which really helps get that golden brown sear. Broiled crab cakes are also pretty delicious. 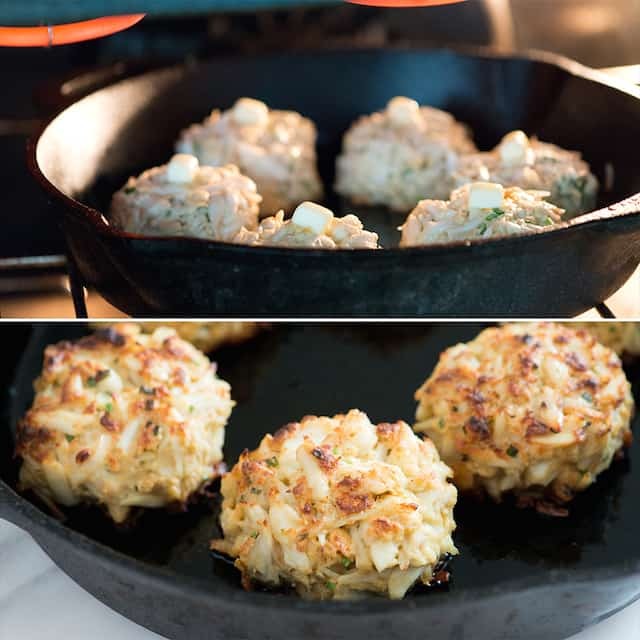 We like to start with a hot pan on top of the stove until the underside of the crab cakes are golden brown. Then, we add a little dot of butter to the tops and broil until golden brown. The nice thing about broiling is that the cake is never pressed or squashed flat. The tops stay perfectly rounded. Ask most Marylanders and they will have a preferred cooking method. If you don’t know which you prefer, try them both, you really can’t go wrong! When we make these at home, we’ll always serve them with a lemon wedge, a little tarter sauce (here’s our homemade version) and if we’re feeling it, a touch of Old Bay Seasoning (just be careful, it’s pretty potent). Joanne loves turning her’s into a sandwich and I pretty much eat them out of the pan (I can’t help myself). Try our crab cakes with one or two of these popular sides: Smoky Black Bean and Corn Salad, Perfect Potato Salad, Rosemary Roasted Potato Wedges or our Baked Sweet Potato Fries. 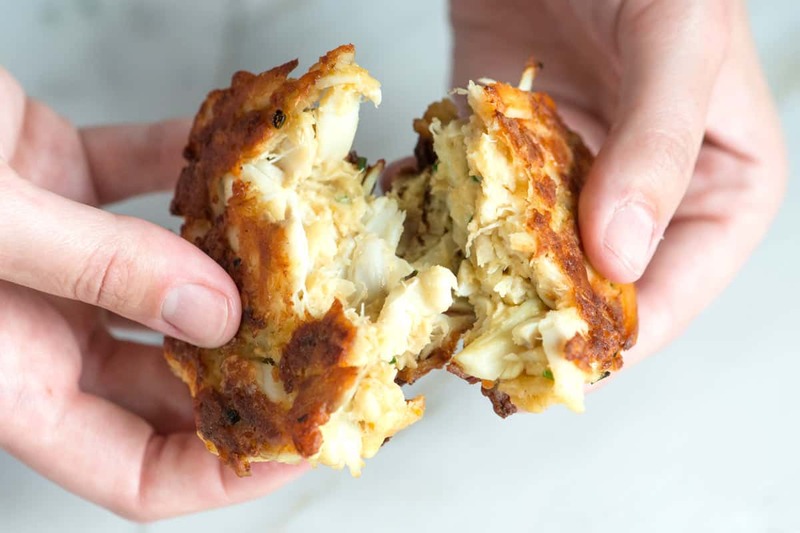 Spending much of our childhood and young adult life in and around Maryland, we like to think we know a little when it comes to a great crab cake. We’ve enjoyed countless crab cakes and have come to the realization that our favorite is this one — it’s simple with few ingredients, little filler and tastes of sweet crab. When we’re out at our favorite restaurants, we usually get three options for how the crab cake is cooked: fried, pan-seared and broiled. We hardly ever choose fried, but often go for pan-seared or broiled. We have shared our method for both options below. Drain the crabmeat, if necessary, and pick through it for any rogue shells. Toss the cracker crumbs, herbs, and crabmeat together, using your fingers to gently break apart some of the lumps. Whisk the mayonnaise, egg, mustard and Worcestershire sauce together then stir into the crab mixture. It will look somewhat loose. Cover with plastic wrap and refrigerate at least 1 hour. Scoop the crab mixture into six 1/2-cup mounds and lightly pack into patties, about 1 1/2 inches thick. Cook the crab cakes — our method for pan-searing and broiling are below. In a 12-inch nonstick or cast iron skillet, heat the oil over medium heat. When the oil shimmers, add the crab cakes to the pan. Cook until the underside of the cakes are dark golden brown, 4 to 6 minutes. Carefully flip the cakes, reduce the heat to medium-low, and add the butter. Continue cooking until the second side is well browned, 4 to 6 minutes. Position an oven rack 6 to 8 inches from the top of the oven. Turn broiler to high. In a 12-inch oven-safe skillet, heat the oil over medium heat. When the oil shimmers, add the crab cakes to the pan. Cook until the underside of the cakes are golden brown, 3 to 5 minutes. Cut the butter into six pieces then add one to the top of each crab cake. Slide the pan under the broiler and cook until the tops are well browned, 4 to 6 minutes. How to make mini crab cakes or crab balls: Instead of making six large crab cakes, divide the crab mixture into 24 mini crab cakes. WONDERFUL,,,,THX,,, Was close to Fredick MD last year,,,wish I could remember the place, close to a Hampton and little joint on a river ,,,99.9% was crab meat, so wonderful,,,wish I could get these in MI,,,,they put so much other C___ in the ones around here….Yours are GREAT,,,Thx. This recipe is spot on. I lived on the Chesapeake most my life eating the best crabcakes from Annapolis to Ocean City. The only recommendation I would add is to be very careful NOT to break up the crabmeat when picking out shells and tiring ingredients. We only use our hand to Flip the meat over a few times to incorporated the mayo mix. Never pat them or form like a burger either. Having experienced Maryland Crab Cakes in Baltimore (and sharing my life with a man who was born and raised in Baltimore) we are quite picky and serious about our crab cake recipe! This recipe is as close to the real thing if you don’t live in Maryland…we add an extra ingredient, 1 1/2 to 2 teaspoons of Old Bay seasoning, use only 2 tablespoons of Mayo instead of 1/4 cup, and omit the oil (we use butter instead). 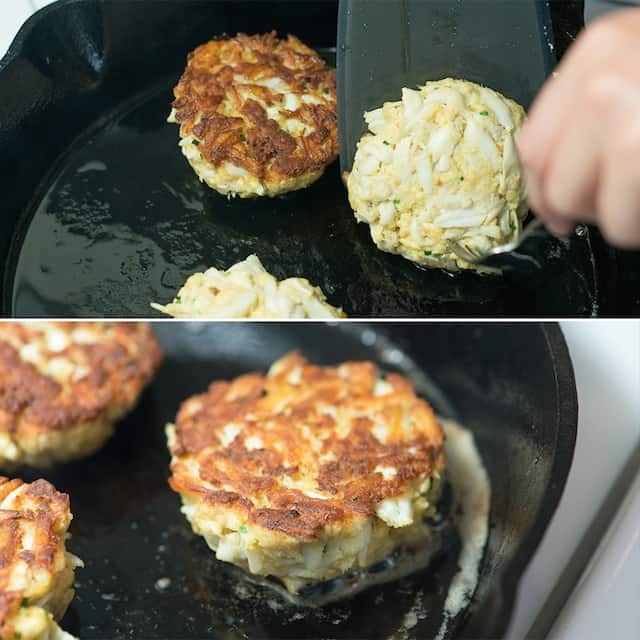 We broil the crab cakes because we love the rounded tops and use the same method of stovetop to brown the bottom and put the pan right into the oven under the broiler..the end result is perfection! Thanks for sharing your saltine recipe…saltine crackers is exactly what they use in Maryland and I wouldn’t substitute any other cracker in it’s place. 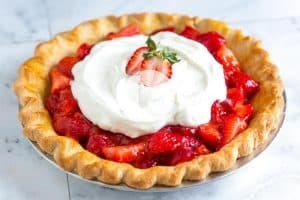 This recipe is easy to follow I give it two thumbs up! I’ve been making some form of crab cakes for years being originally from the east coast. However, I LOVE LOVE LOVE this recipe using saltine crackers. It’s absolutely perfect! They are so delicious my platter of cakes disappears before my eyes! Thank You for sharing. I was just about to make these delectable crab cakes that recommended saltine crackers. I looked at the saltine ingredients and they contain milk; wife is lactose intolerant… While at the market I thought of substitues, oyster crackers, nope contain milk. Any suggestions for another “filler/binder”? Hi Steve, I’m not quite sure, but most crackers will work. You can also try ground up cereal like Chex or bread crumbs. After reading this I decided to look at ingredients right around my kitchen and found that Great Value brand hard taco shells do not contain milk. Maybe that could be used if crushed extra fine? Hi Tammy, I bet that would work. They will add an extra flavor (corn), but hey, I love eating blue crab next to buttered corn, so I’d go for it! Just bash them into tiny bits, like how we crush the saltines in our video above. You could also toast white bread or butter topped bread to use as a filler. I tried both and it comes out amazing. AMAZING. I grew up by the ocean and love all things seafood. This recipe was out of this world. Made them for my husband & I, he was an instant fan. Took some for a family function, now I’m in trouble, official crab cake maker now 😁. Thank you for sharing. 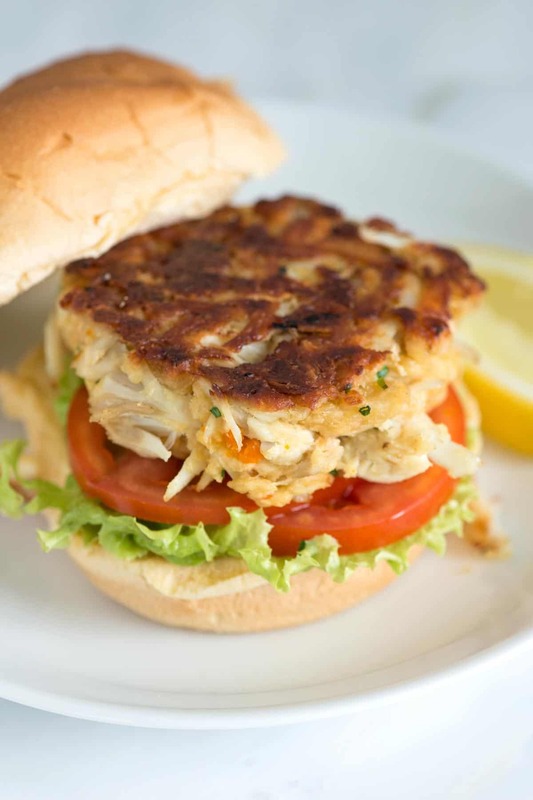 Delicious crab cake recipe! 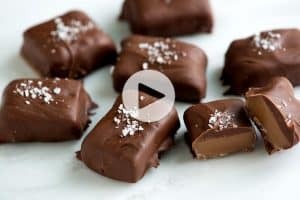 I used this recipe twice and they are a huge hit with my family. 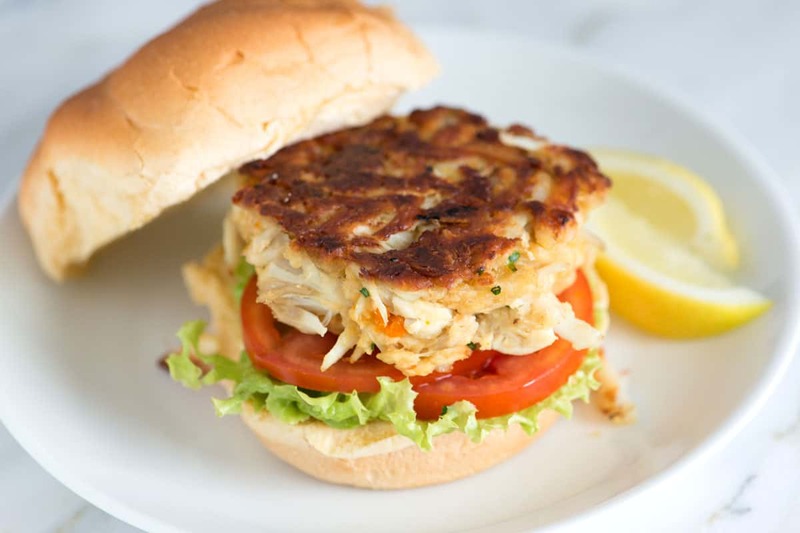 The ingredients are just enough to hold the crab cake together and enhance the flavors of the delicious crab! I am saving the recipe as my go to. Outstanding! Big hit with my Army buddies and their wives! Thank you! Being that I am from Maryland. I like to use ritz crackers for the buttery taste and don’t forget to add 2 tsp of old bay to mixture before adding the crabmeat. That is what makes it Maryland lol. I never added an egg to classic Maryland Crab Cakes ,nor mustard, mayonnaise or parsley. Lump Crab meat is essential to let it be the star for its sweet taste that needs minimal additions, though Saltines are essential. Phenomenal Recipe! Thank you so much. I’ve added, scallions and sweet jalapeños (my own pickeling) as well as Old Bay to the cream mixture. I live in the UK. I have never seen saltine crackers in our supermarkets. The nearest are cream crackers or Ritz crackers which are smaller and slightly salty. 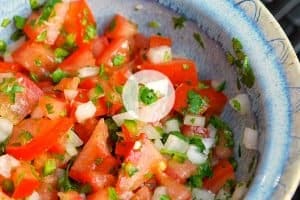 Have you any idea which would be suitable for this recipe or any suggestions for an alternative. Look forward to hearing from you. Both will work very well. Ritz crackers will add a buttery taste (some in Maryland actually prefer using them over saltine crackers). These look great and I want to make a very large batch for a party. What’t the best way to cook these when making the mini crab cakes?Do you form them into little patties or crab balls? Pan fry, bake or broil? Hi Catherine, We recommend making mini crab balls then pan frying on one side and finishing by broiling the tops until cooked through and brown. I’d expect to get 24 mini crab cakes from our recipe. Tried the crab cake recipe and the mayo recipe. Only major modification was that I was out of crackers so I used panko – still came out great. This will be a frequent treat at our house going forward!